MosnarCommunications.com today announced the introduction of ICE Ultimate Luxury Cinema via their luxury PR brand portal. 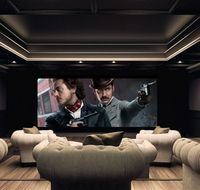 ICE cinemas combine the talents of experts in cinema, design, execution and luxury to deliver the only systems in the world bringing the Hollywood Experience home. ICE Cinemas start from $ 1 Million and go up to $5 Million or more. All ICE designs are individually tailored to the most exacting standards for audio, video and infrastructure performance. Only the finest components are selected and no compromise in the system chain is tolerated from power supply to playback. ICE designs enjoy full and personal Hollywood sign-off, allowing the latest blockbuster and classic movies to be enjoyed in a quality far higher than is found in even the most modern commercial cinemas. MosnarCommunications.com, offers luxury PR branding services and resources for luxury social media engagements. Seasoned in luxury technology and design also pioneering the launch of Artopz Minitopz history making for the world’s first desk lamp PC. “ICE cinemas offers something special to the affluent consumer by solving the problem to create luxury technology and design. We are honored that they contacted us to utilize our luxury PR branding platform,” CR Cataunya Ransom, Co-founder and Luxury Chief for MosnarCommunications.com. When it comes to luxury PR branding MosnarCommunications.com is at the frontier of exclusive focus groups. Working with top corporations, executives, entrepreneurs, professionals, and affluent luxury consumers. MosnarCommunications.com is owned and operated by Ultisky, Inc.
To learn more information please contact http://mosnarcommunications.com directly.